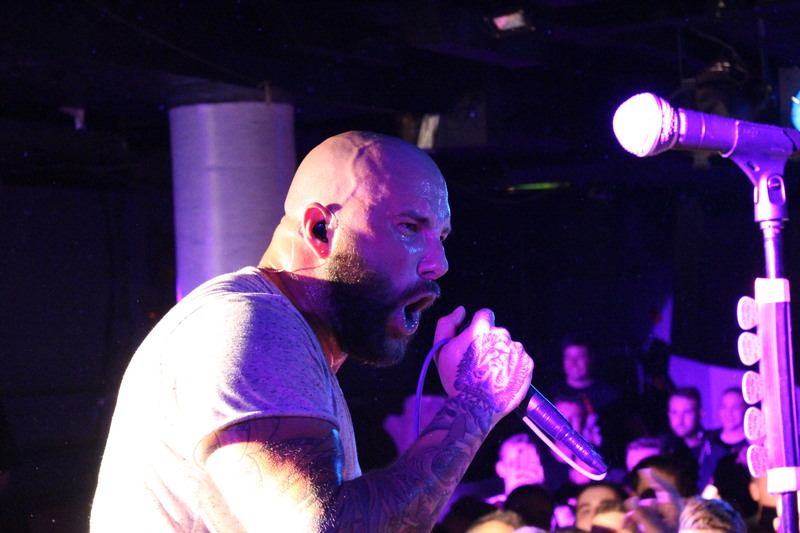 Kicking off their tenth anniversary tour of one of the landmark Metalcore albums of the last ten years, August Burns Red rallied The Underworld for one night of nostalgia. There’s nothing quite like an anniversary show. To try and capture the atmosphere is incredibly tricky, with fans from all walks of life coming together to embrace a band that has clearly had a significant impact on them its a testament to the band themselves. However the show often involves not only the band but just as much the fans taking part to truly make the night special. Ten years ago in June, August Burns Red unveiled their now eponymous Messengers to the world. The first record to feature long time vocalist Jake Luhrs and arguably one of the strongest in their repertoire. Tonight The Underworld is positively about to burst not only from the amount of fans but their enthusiasm. As a deafening rendition of System of A Down’s “Chop Suey” fades out from the PA and the first notes of “The Truth of A Liar” rocket out of the speakers as our hosts for the night are assembled. Unleashing his signature scream Jake Luhrs is not wasting time, ensuring that by the end of it sweat is not only dripping off him but everyone here tonight. Mercilessly the band pummel through breakdown after breakdown, only pausing for a breath between interludes of “The Blinding Light“. As rightfully expected the floor well and truly opes up for the herculean smackdown of “Backburner” seeing the entire Underworld floorboards tremble. One of the many reasons the record was such a divisive release August Burns Red found their calling card, polyrhythmic style breakdowns and guitar work that wouldn’t go amiss in the eighties. The bands tireless worth ethic has proven to be their salvation. Performing an album you wrote some ten years ago in its entirety is an incredibly hard ask but here the band assemble pieces from both their past and present to form a full charged well oiled band. The crowd and myself collectively lose it though when the band leap into “Composure” and here’s where the fun really starts. Being entirely different to the usual performing affair the sense of connection that the band have both together and with fans is something none will be able to replicate. Smiles lighting up The Underworld, with stage dives and high fives all round. The destructive element of the band is of course not lost with the almost Death Metal style introduction to “The Eleventh Hour“. After dousing the crowd with some very much needed water we’re spearheaded into the final section of our Messengers bonanza play through. Possibly the most poignant element to the evening the grand finale of “Redemption” hearing the rousing chants of “I am just a man! With a heart and sinful hands!” almost deafen the band is quite something else. Nailing every track on the record, the band are finally out of the ten year woods. Before treating fans to the newly announced “Invisible Enemy”, bassist and drummer Matt Greiner came together for a truly inspired drum solo making for a well earned break for the rest of the band. Tactical in its delivery, the emphasis on dynamics the band are so well known for positively inhabit the track. You should all be excited for new record Phantom Anthem Before launching into Leveler favourite “Empire” featuring yet another singalong which leaves everyone ear to happy. Ending with the concussive waves of “White Washed” this is your last chance to dance and the fans know it. Jut as the walls of The Underworld are fit to burst as the band triumphantly end their set. Having begun a journey that some would never have imagined ten years ago, August Burns Red have become a force to be reckoned with. Honing their skills, live, the band are absolutely unstoppable. Understanding the technical nuances needed for certain songs, along with their band dynamic working perfectly to nail those stop on a dime time signatures. However what no other band will ever be able to offer is the fierce sense of connection that the band bring to their fans. Proving tonight that the band are not only a huge part of the Metalcore legacy but in the hearts of each and every fan as they walk out of the venue this evening.